The youthful Nets have pushed aside doubt. Next up: The Sixers. Sixers Ben Simmons reacts when he learns that he has been called for a defensive foul in the 2nd half the Brooklyn Nets vs. Phila. 76ers NBA game at the Wells Fargo Center in Phila., Pa. on March 28, 2019. NEW YORK — A small section of Brooklyn Nets fans broke out into a “We want Philly” chant with 2 minutes, 15 seconds remaining in the regular-season finale, a 113-94 win over the Miami Heat on Wednesday at Barclays Center. The win secured the No. 6 seed in the Eastern Conference for the Nets and capped a a 42-40 season for the franchise’s first winning record since 2013-14. The accomplishment of going from a 28-win team last season to a playoff contender was overshadowed for most of the night. In Dwyane Wade’s final NBA game, the Barclays Center was filled with cheers for Wade and boos during D’Angelo Russell’s postgame interview — from a crowd overwhelmingly clad in Heat jerseys — creating a din that the Nets fans couldn’t overcome. Despite the fanfare for Wade, the significance of what this season and the coming postseason means for the Nets is not lost on coach Kenny Atkinson. In his third year at the helm in Brooklyn, he’s shocked by what his young team has accomplished. That’s where the Sixers and the Nets differ. Brooklyn is in awe of its youthful squad that has pushed aside doubt and made the playoffs. No matter the result, this season was a success. 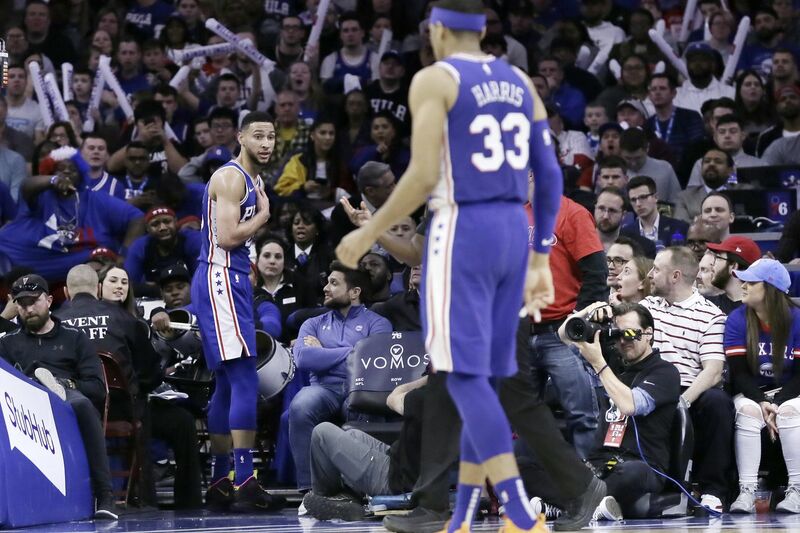 But, for the Sixers, after two blockbuster trades and the declaration that they’re aiming for the NBA Finals, an early playoff exit would spell failure. The Sixers have the upper hand as far as experience goes, and in the playoffs experience is valuable. Atkinson, who will be game-planning for a playoff series for the first time as a head coach, is mindful of the kind of mountain his team is about to climb. Seven. That’s how many players on the Nets have zero playoff experience. Then there’s Spencer Dinwiddie, who has exactly two minutes of playoff experience, and Joe Harris, who has played 16 minutes of playoff basketball. So the Nets are going into the postseason hoping advice from veterans Jared Dudley and DeMarre Carroll carry them. As far as the Nets’ chances against the Sixers, Russell pointed to the games the teams played in the regular season. The Sixers were blown out by the Nets on Nov. 4, 122-97. Then, with a Jimmy Butler buzzer-beater, the Sixers prevailed, 127-125, on Nov. 25. The Nets came away with a 127-124 win on Dec. 12, and then the Sixers had their best outing against Brooklyn on March 28 in a 123-110 win. While Atkinson didn’t want to discuss the matchup, choosing to revel in the joy of a winning season, he did say that the short distance between Philadelphia and New York will add some spice to the series.